When it comes to adventure sports, Queenstown is “the” place to be in New Zealand. BUT, that doesn't mean that you can't do crazy stuff elsewhere in the country — after all, this is the birthplace of crazy pursuits like bungee jumping and jetboating. 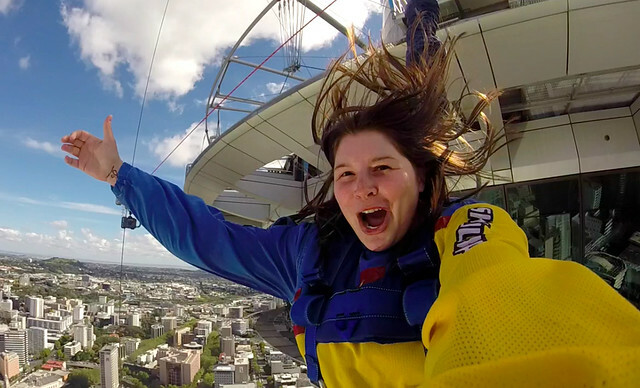 If you're looking for an adrenaline rush on the North Island, look no further than the in Auckland. The Auckland Sky Tower, standing 328 meters (1,076 feet), is the tallest building in the Auckland skyline. In fact, for a long time it was the tallest building in the southern hemisphere. 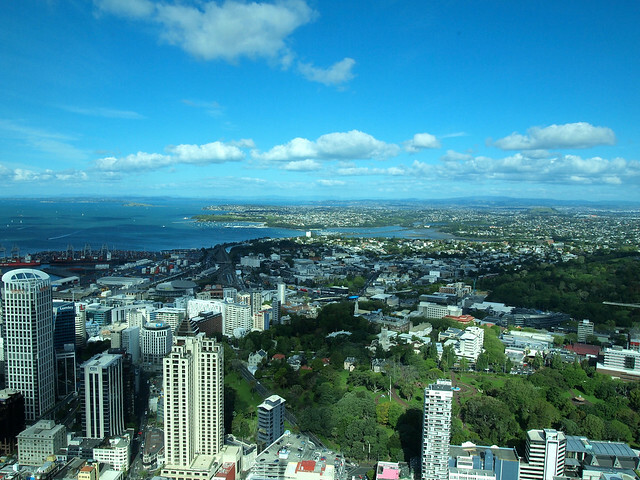 You can take the glass-bottomed elevator up to the 60th floor for 360-degree views out over the city of Auckland, and even eat in a revolving restaurant on the 52nd floor. But if you're looking for a rush, staying inside just won't cut it. How about a walk around the 53rd floor of the tower? Or a jump off of it? Well, good news: you can do both! 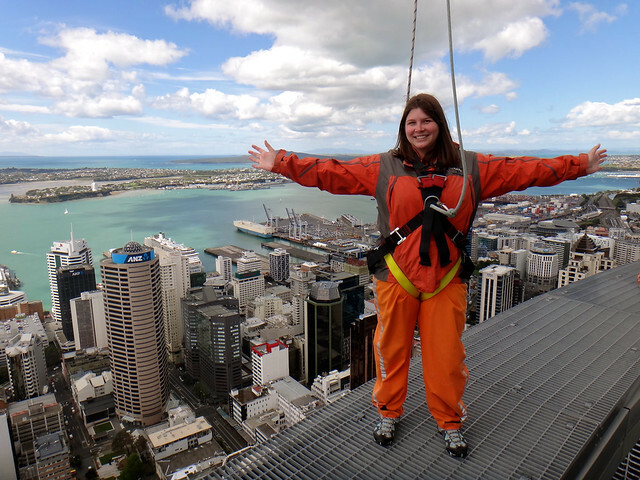 I began my adventure in the sky with the , a 45-minute(ish) walk around the Sky Tower on a 1.5-meter-wide outdoor platform 192 meters (630 feet) above the ground. The walk is incredibly safe (you go through a ton of safety checks before you even get in the elevator), but it's definitely not for the faint of heart. 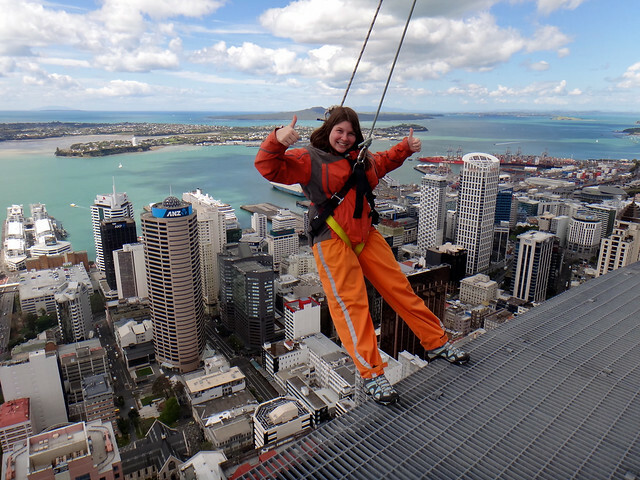 Outfitted with harnesses and safety ropes, our group slowly made its way around the outside of the Sky Tower. 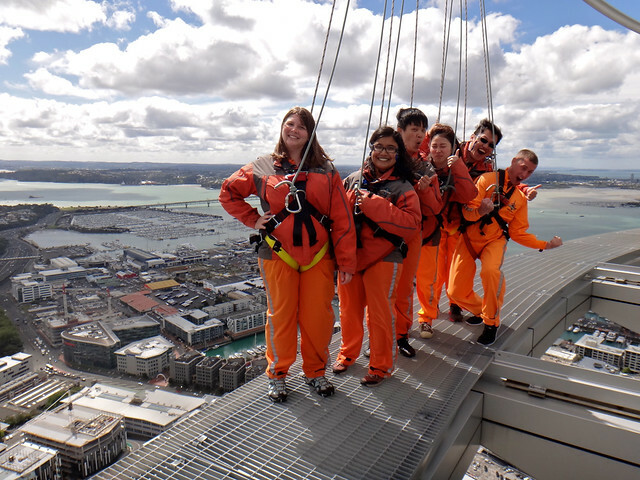 Along the way, our guide pointed out different parts of Auckland, as well as set us different “challenges.” Hanging over the edge of the platform backwards and forwards; walking without looking down; walking backwards. Some of these WERE indeed challenges — it's amazing how much scarier things get when you're a few hundred feet up in the air. Totally worth it, though, since you can't do something like this everywhere. After getting used to the height, it was time to get closer to the ground — by jumping off the tower, of course! The is unique in that it's NOT a bungee jump — it's actually a guided fall to make sure you make it safely to the ground without, you know, being blown into the tower by the wind. This means that there's not as much free fall as a bungee jump, but that doesn't mean it's not scary! After being weighed (eww, I know) and suited/harnessed up, I took my position at the end of the jump platform, GoPro strapped to my wrist. I leaned out as far as possible, so the actual “jump” was less of jump and more of a giving in to gravity. Fun factor, though? VERY high. If you need a rush, this will definitely give it to you. To be honest, both of these things are so different (and so unique) that it's tough for me to choose a favorite. Why not just do what I did, and try both?? – $290 NZD ($230 USD). This is what I did: the SkyWalk AND the SkyJump. 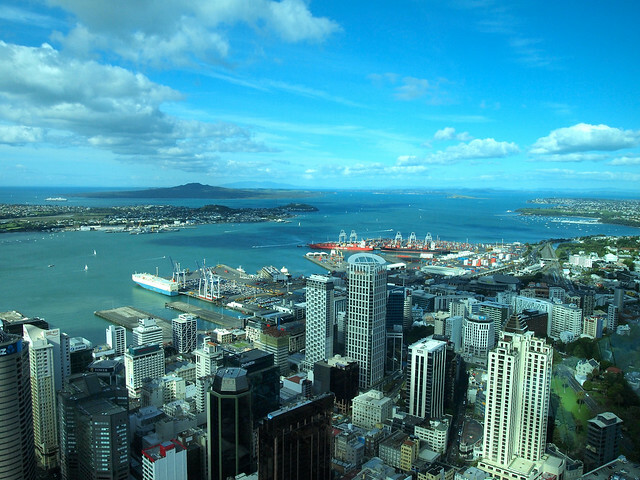 Afterwards, you get a free pass up to the observation deck of the Sky Tower, too, which is a nice bonus. Would YOU attempt either of these in Auckland? *Big thanks to SkyWalk/SkyJump for sponsoring my walk/jump and providing me with most of the photos and video in this post, too! As always, all opinions are my own. Have seen this jump a few times! It looks awesome! I love how adventurous New Zealand is. Some fantastic views from the top! 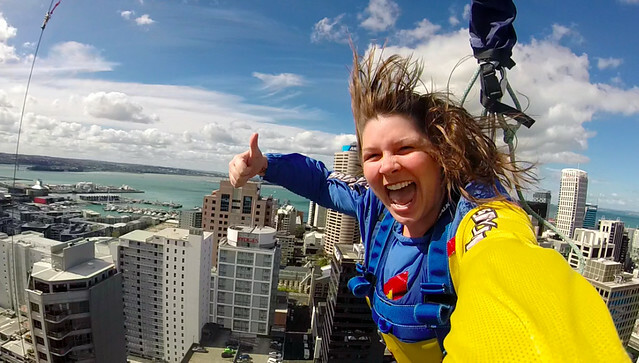 Yup, if you want to feed your adrenaline addiction, New Zealand is definitely the place to come! That seems pretty wild … I would not expect anything less than this from the Kiwis! Me neither! They come up with some crazy stuff here! No way, not ever! We stayed in Auckland for 3 nights and sadly, it rained the entire time. We stayed at a Hilton Hotel right on the docks, it’s the white hotel that looks like a ship, and our room overlooked the water which was lovely, even through the rain. We still enjoyed our experience, rain or not and we did take a road trip out to the Tongoriro National Park, which was stunning. Bummer about the rain, but what a cool hotel to stay in! I love how they built it to sort of resemble a ship. Glad to hear you enjoyed your time there anyway, despite the rain. I did the jump. I don’t think my legs would have coped with the walk. All that leaning off the edge would have ruined me! You even looked pretty calm! Well done! The walk was actually scarier than I thought it would be! Heights don’t really bother me, but being told to walk backwards without looking down was definitely not easy! To be honest, I am pretty scared of doing any of the adventure activities, but I really wish to try bungee jumping once and that too in NZ! I guess there is a feeling of freedom while doing such things, isn’t it? Definitely, Renuka. A feeling of accomplishment, too, when you challenge yourself and do something that scares you. 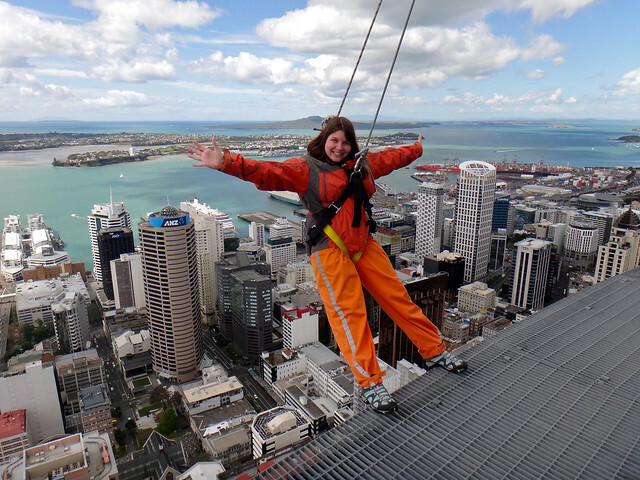 And if you’re going to do a bungee jump anywhere in the world, do it in NZ! This looks awesome- you look so calm, too! I would definitely love to try this. If the walk had been open when I first arrived, I totally would have done it. But considering I paid to go to the observation deck my first day in AKL (they hadn’t created or opened the walk yet) and then ended up working at SkyCity for a few weeks (and going to the top for free multiple times) as well as eating at the top for my goodbye lunch at another job I had in AKL, by the end, it wasn’t worth it to pay for the walk! Maybe in the future you’ll decide to do it – I promise that it’s VERY different walking around the outside than seeing the city from the observation deck! This seems really cool! I don’t know why but I think I’d find the SkyWalk a lot scarier than the SkyJump, so if I had to pick only one I’d probably go with the former. Congrats for keeping your poise doing both! To be honest, the SkyWalk WAS a bit scarier than the jump (at least, in my opinion!). The jump is over quickly, whereas the walk takes much longer and you’re much more aware of how high up you are! I did something very similar to this in June when I was in Toronto – it was around the CN Tower and it was called EdgeWalk! Although there was no “SkyJump” option. To be honest, that seems like the scarier choice but I probably would have gone for it had it been offered. Go big or go home! Oh cool, I didn’t know they did this in Toronto, too! Will have to keep that in mind – it was really fun! Also, the weighing would make me extremely nervous. Don’t you think their gear should be able to handle at LEAST 300 pounds???!?!! Meaning, it should be pretty obvious looking at person your size that it will not break?!?!?! Way to go! I live close to Dubai and have always wanted to take a jump off the world’s tallest building. But of course I can never muster the courage. 160 something floors is JUST TOO MUCH! I think the Auckland tower would be a safer place to start. Heh heh. Whoa, I didn’t know they did something similar in Dubai! That would be crazy!! Lol, love the video. Would be awesome if you can caption it for me and other deaf viewers. I didn’t realize the waters of New Zealand was colorful, the aquamarine colors. But it looks like a fall I would enjoy. Thanks for letting us know about this. The videos are just set to music (without words), so there’s nothing to caption! 🙂 Glad you enjoyed them, though. Oh, excellent. Glad to know I didn’t miss anything. I noticed you and the “handler” (I’m guessing the company rep) talking and could hear voices so that’s why I was curious what you two were saying at that moment (the first few seconds).